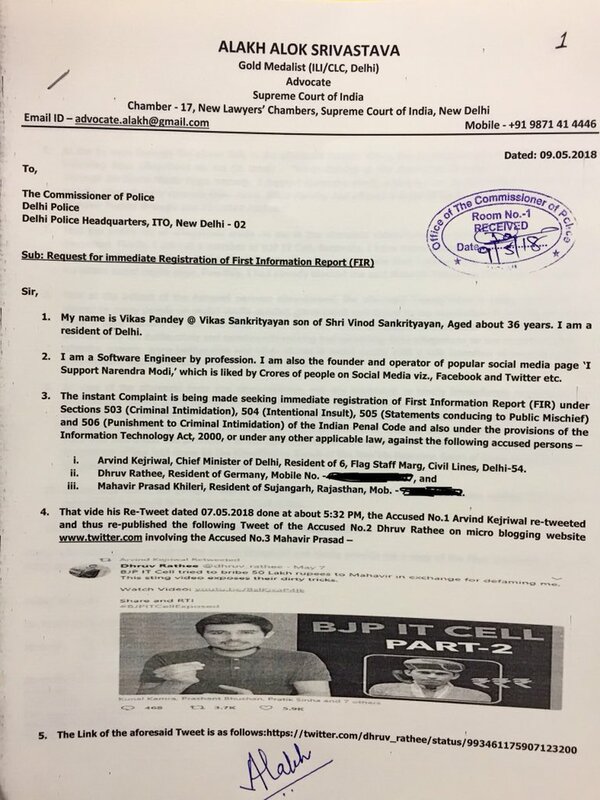 A police complaint has been filed by Advocate Alakh Alok Srivastav on behalf of software architect and BJP volunteer Vikas Pandey, against Aam Aadmi Party chief Arvind Kejriwal and conspiracy theorist and AAP supporter Dhruv Rathee, for accusing Pandey of offering a bribe to one Mahavir Prasad. In a YouTube video posted by Rathee on 7th May, where he accused Congress supporting troll who was once followed by Kejriwal, Abhishek Mishra of offering ‘bribe’ of Rs. 50 lakh on behalf of Pandey to one Mahavir Prasad, self-proclaimed former BJP IT cell ‘insider’. 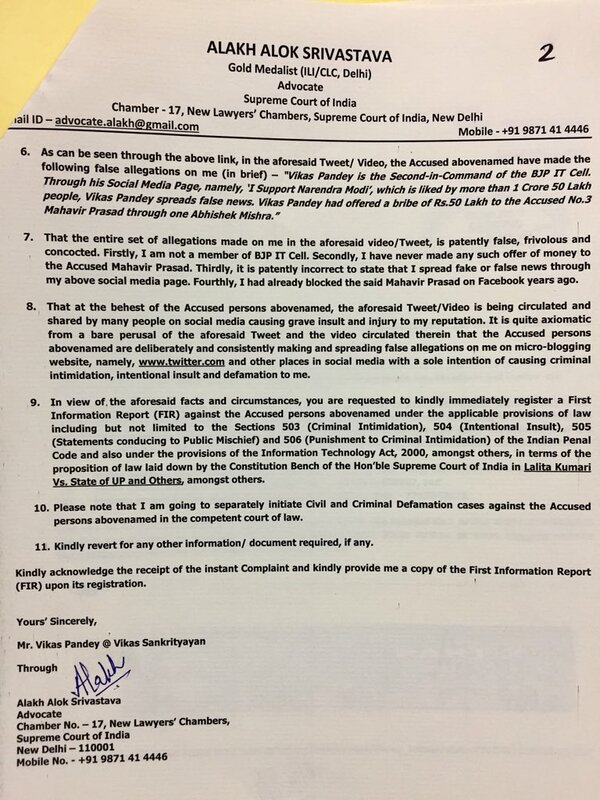 The complaint states that the information shared by Rathee and Prasad is false and is causing harm to his reputation. That the accused are deliberately spreading false allegations on various social mediums with the sole intention of ‘causing criminal intimidation, intentional insult and defamation’ to Pandey. The complaint also states that Pandey intends to initiate civil and criminal defamation against the accused. Rathee accuses the same Abhishek Mishra who was once seen cosying up with Arvind Kejriwal, who had once tweeted a fake news shared by Mishra, of now being a ‘BJP insider’ who offers bribes on behalf of BJP. 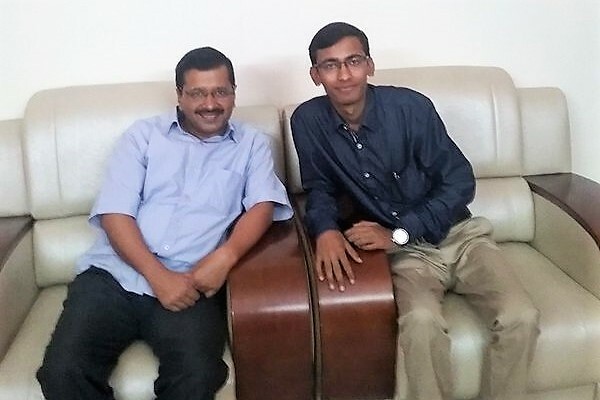 Kejriwal and Mishra have also met and spent quality time. 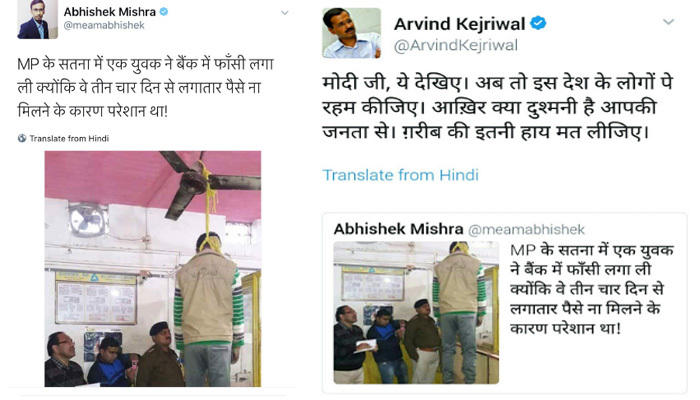 Perhaps after discovering Mishra consistently spreads fake news, Kejriwal unfollowed him. After that, Mishra was recently spotted getting up close and personal with Congress President Rahul Gandhi.